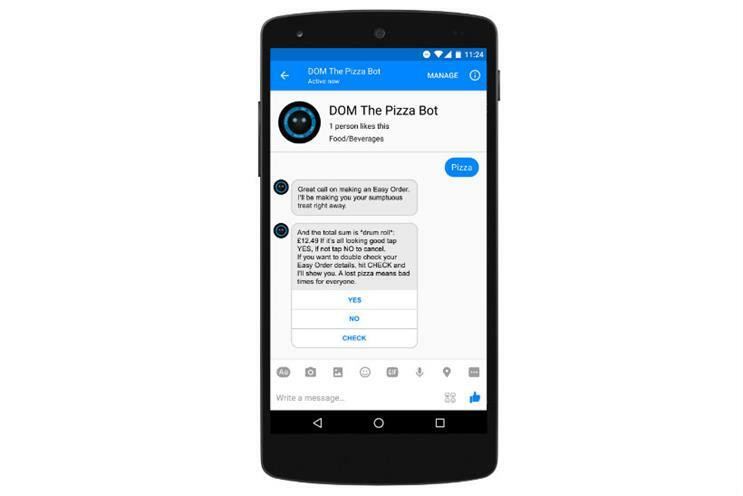 Domino's has launched its own Facebook Messenger bot, allowing customers to order a pizza through the messaging service. The bot doesn’t allow users to customise their pizza through Messenger. Instead customers must first set up an Easy Order profile by registering to the Domino’s website. This allows them to set up their delivery address, payment details, contact details and their favourite pizza order. Messenger users who find and add @DOMThePizzaBot can message the word "PIZZA" or send a pizza emoji to order their favourite pizza. In time, the company will also send customers content through the bot. The bot was created with We Are Social and Talkbe. Nick Dutch, Domino’s head of digital, said: "We’re delighted to allow our customers to order direct from Messenger – with one billion monthly active people using Messenger each month – it’s the obvious choice for Domino’s." Rival Pizza Hut also launches its pizza ordering bot this month, which also offers a Q&A function to answer customers questions about deals.